I grew up in a small town and we never had the money to buy fancy things. In fact, most of the fancy things that I got to see on the television box were never available in my town. Discovery channel was the only source through which I could see the world. It was my heart's true desire to explore the world through my own eyes. My first trip was Bali and ever since I have not stopped. As an avid traveler, it is necessary to own binocular, great hiking shoes and a travel bag which is easy to carry. I think you can buy a bag and shoes as per your comfort and personal style. However, the binoculars are something that you cannot buy JUST LIKE THAT! A binocular is an optical device designed to offer magnification for those wishing to view the far-off objects. Whenever I used to go hiking or a safari, it would be difficult to see the animals and the beautiful mountain range. Of course, it is probably located at a far off distance and I have no intention of getting up-close and personal with a real tiger. The most powerful compact binoculars helped me to achieve that! Even though I have fantastic eyesight, it helped me to see things clearly and from a different perspective. It is important to read reviews and check out the buying guide before you invest in the best compact binoculars. Yes, you heard that right, my friend! As a keen traveler, you need to invest in top-rated compact binoculars which are easy to pack and carry. If the idea is to travel often, you cannot explore the world with heavy baggage. I have used many binoculars in the past 10 years and have a fair bit of experience when it comes to choosing the right one. Here's a post which talks about the concept of compact binoculars, the benefits, a quick buying guide and the 10 best travel binoculars for you! I have put in a considerable amount of efforts to pick the best 10 and you will find the pros and cons of each product. Take a look! Who needs a Compact Binocular? A good binocular should not be a burden for the traveler. An excellent binocular does not have to cost a bomb or be the heaviest. It is a common misconception that good things are heavy and expensive! Let us go beyond this stereotypical thought and understand what good compact binoculars could do for your upcoming trip! When a novice has to choose between two types of lenses, it may seem overwhelming because you have no idea about what those specifications mean! I am an adventure junkie and can feel you! There is a lot of technical jargon around the internet and it can confuse you BIG TIME! Let me make things easy for you by explaining what a compact binocular is. Firstly, separate the two words and look at the second one first. A binocular is a device which is tailor-made for making far-off objects appear nearer and larger. Two telescopes are amalgamated or hinged together to create this device. In Layman language, you may have seen the zoom option on your phone camera. Once you zoom, you can see far off objects with a clear view. Similarly, the binocular is something that you use for viewing the distant objects. Now add the 'compact' word for this and you will be elated to know that a compact binocular is not the heaviest and is easy to carry for any expedition. Whether you are skiing, going on a jungle safari or even hiking, a compact binocular can come in handy! As a traveler, you do not want to carry extra baggage or accessories which are too heavy. Now that you are aware of the concept, it is important to understand the benefits of using or owning the best lightweight binoculars. When you are holding a heavy binocular, it is possible that it will shake. When it shakes more often, you will get a shaky view or image from the lens. With a compact binocular, you can hold it easily as it is lightweight. This way you will get a clearer image without any disruption. It is a common misconception that smaller binos are cheaper. In fact, the price goes up because the weight and size go down but the efficiency should be the same. However, there are some cheaper models which are efficient and great for travel and hunting usage! Most of the compact ones are waterproof as well. There is no guarantee that the mountains or jungles would be dry. Since it is compact, you can easily carry it along with you in your handbag or the baggage you are carrying. Adventure junkies should always invest in something portable. Now that I have mentioned the benefits, it is important to know as to who needs these binoculars! Let us take a look at the next section which clearly outlines as to who needs a compact binocular. Are you a deer hunter or a bird watcher? I asked this because different binoculars have their own specialties. If you are hunting a deer, the binocular has specific optic requirements. In fact, you would have a different optic requirement for any animal you hunt. Whether it is a game or a deer, the requirement is absolutely different. I have covered these elaborately in the 'Things to Consider while buying' section. The best lightweight binoculars are basically for anybody who likes to get into trouble! They are meant for adventure junkies, wildlife enthusiasts, bird watchers, photographers, hunters and even excited travelers like myself! The best compact binocular will always come in handy! As a wildlife enthusiast, I always wanted to see the dangerous animals like the lion, cheetah, and tigers. I cannot go inside the jungle and roam around freely in their habitat. Can I go to these wild animals and ask them how they are doing? The answer is NO! Nature is best seen from a distance because the trees, plants, fruits, and even the animals do not wish to be disturbed. The birds are free and once you get closer to them, they tend to fly away to another destination. This could be frustrating for the explorers and the photographers, who wish to have a good look at the colorful and rare birds. It will be foolish to NOT take a binocular with you. Whenever you are off for a trip to any destination, this magnification device is a must! This will help you to see the best sights with your own eyes. You can watch the shooting stars, the dancing peacocks and even the ice-capped mountains with lightweight binoculars. The best compact binoculars are ideal for all those who are always on the go and some even need it for their profession. If you are running an adventure sports company, it is best to keep binoculars in bulk, because your clients may need it in their journey. Additionally, buying binoculars in bulk could be expensive and that's why always opt for the cheap and compact ones. I have to say that there is a lot of misleading information out there. It is supposed to be 'World Wide Web' but the majority of the people are not giving you the correct information. The good news is that this post covers everything that you need to know about binoculars. I have covered every point that would help you make a wise decision. The question is - How did we pick the best products for you? As I mentioned before, traveling has been my first love and passion for more than 10 years. I have personally bought 15 different binoculars in this duration and will never suggest a bad one to readers. With great power comes greater responsibility and that is precisely why I do not wish to give you misleading information. 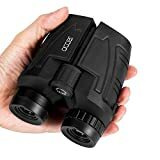 After conducting thorough research and using different products myself, I finally found 10 products which fit different budgets and have all the features that a good binocular needs. After reading hundreds of reviews on different sites, I bought the compact binoculars for myself. I used them and noted the pros and cons. My intention is not to sell these products to you but it is more about being a wise buyer. There are plenty of advertisement and close friends who would tell you different things but you need expert advice. 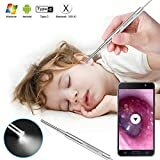 I personally checked the Amazon reviews and ratings of each product. Additionally, I never buy a product which does not have any reviews or ratings. 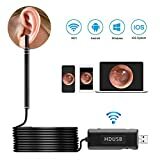 After checking each review and using the products myself, I came up with this list. To make my research valid, I talked to some buyers who use these products. They gave unbiased reviews and feedback which was enlightening for me! There are cheap compact binoculars included in the list. You can choose as per your budget and requirements. After years of extensive research and spending my own money to try out different binoculars, I can proudly say that this post is legit and the products listed are compact, affordable and suit different requirements. As a travel enthusiast, I am always waiting for the next best binocular and my hunt will always be on. As time passes, better products enter the market and it becomes difficult to narrow down the choices. I have closely assessed the quality of each of the products and kept in mind the prerequisites or the 'must-have' specifications. Now let us take a look at the things to consider while buying the best compact binocular. What are the things that you need to keep in mind to buy the finest lightweight binocular? While the novices think that it is super easy, we believe that you need to consider too many things. Well, I have been in your shoes and thought as much. Let us find out the prerequisites before we look at the best compact binoculars review list. Are you buying the best compact binoculars for birding, hiking or hunting? When you buy the binocular, you need to keep in mind the purpose of buying it. Of course, you cannot buy the binoculars used for astronomy because they tend to be bigger in size. For backpacking and hiking, the weight of the product is a serious concern. A reverse porro prism or a roof prism would be ideal. The ideal size for this use is 8X25. If you are taking it for the marine purpose, opt for something which is water-proof. For such uses, low magnification is ideal and the suggested size would be 7×50. Magnification – The magnification is the pivotal part when it comes to choosing the best binocular. How does the prospective buyer identify the magnification feature? It generally has an ‘x’ along with it. The majority of the best binoculars have a 10x or 12 x magnifications. This basically means that the device can magnify the given object 10 times or 12 times. Different situations require a different level of magnification. In a forest, you would need a different level of magnification as compared to an open field. Objective lens – Secondly, you need to focus on the objective lens size. This is another important aspect that you cannot miss. This basically shows as to how much light passes inside the device. In a nutshell, it means that the more the light enters into the device, the better it will perform in low-light situations. How do you identify the objective lens value? It usually comes after the magnification value. 10×25 means that the magnification is 10 and the objective lens is 25mm. FOV – The FOV or the field of view is measured through the degrees. If you are opting for a larger degree, your eyes will get to see a larger area through the lens. This can be either expressed via an angle or the width. Do note this : More power = Narrow FOV If there is wide FOV then it will not work for those, who wears an eyeglass. For the bird watchers, this is not a major concern as such. However, if you are a glass-wearer, choose the binoculars wisely. Exit pupil – When you are choosing binoculars, you will find the exit pupil numbers too. If the exit pupil is large, it will absorb more light which means you will get to see a clearer and brighter image in poor light situations. For example, you are planning a hunting trip in the day time when the sunshine is gracious enough. You would not need a large exit pupil for this situation because there is a lot of natural light. Exit Pupil is basically known as the light of the eye! If there is less light in the environment, opt for a larger exit pupil. Prism – These are the internal reflections. There are two types of prisms – 1. Porro and 2. Roof. The Porro was a popular pick in the 1960s. These days the roof prisms have become a popular choice as they are light, comfortable to hold and are compact. The roof prism is certainly less complicated than the Porro prism. Also, the porro is less durable than the roof one. However, do not think of them as an inferior choice because they are great for soaking in the views from your balcony. The roof prisms are for serious users, who want great Plus, they are more durable and ideal for those who are always on the move. Always opt for Bak4 prism as that it is the most superior. It is better than the Bak7 version. Relative Brightness – RBI or the Relative Brightness Index is basically how your binocular performs in low light situations. It is ideally the hypothetical estimation of how bright the picture or image would be in the binoculars. The Exit pupil value is squared to get the RBI. Eye Relief – If you wear glasses, then it is important for you to know this terminology. Eye relief is basically the idyllic expanse that the eyes should be from the eyepiece. If the eye relief is long, it would be best for somebody who does not wear glasses. For those, who wear glasses, it is best to opt for 16mm. If it is more than 16mm, it is better for you. Anything less than 15mm is good for non-glass wearers. Diopter – If the diopter adjustment is not right, you will get to see a blurry image. This is not a favorable condition because everyone wishes to see the surroundings clearly. You will find it on the binocular as an adjustment ring. It can be customized as per the needs of your eyes. Everyone has a different set of eyes and it is best to find the diopter adjustment to set it as per your eye requirements. Focusing – In a binocular, there are two types of focusing. Let me take you through both the types so that you can understand which one is best for your usage. 1. Independent Focus – This is ideal for heavy fields. In the IF, you can set and adjust the eyepiece independently and separately. 2. The Central Focusing wheel needs to be rotated. Out of these two, the IF does not have the close focusing capabilities as the CF does. CF is much easier to use as compared to the IF. However, IF is certainly less expensive and the damage rate is low. I hope you would have some time to understand these binocular specifications, and I believe you would find pleasure reading them. There are some binoculars which are meant for marine purposes. When you are out for an adventure, it is possible that you may drop your binoculars in a puddle or it might start raining. In order to be on the safe side, the prospective buyer should look for the waterproofing feature. The majority of the people make the mistake of choosing a beautiful design over quality. Always check the reputation of the manufacturer. You can find the reviews of existing customers on different sites. The quality of the product should be the most important criteria for you. It should be durable, easy to clean and maintain and should be efficient enough to help you see distant objects clearly. Keep a binocular bra to keep the binos in place. This basically means that you need to attach a harness to the product. When you invest in a product, ensure that it comes with a carrying case. If you are using the product on a regular basis, go for something which has a hard exterior and is easy to clean and use. A cleaning guideline book is necessary because a novice would require instructions to clean the product. A safe and tight grip is needed for comfort. Opt for a binocular which has the non-slip feature because that would give you a better grip and you would be able to use the device for many hours without any accidents. Make sure that the product comes with a warranty. Of course, the price matters but the product must come with a warranty. The best compact binoculars will come with an extended warranty or at least some year’s warranty. This is a much-needed because a binocular may require replacements, spare parts and even fixing. Different manufacturers offer warranties of varying duration. Some may offer you a 2-year warranty while the others may even offer a 5-year warranty. There are some generous yet wise manufacturers, who offer a lifetime warranty (limited). In case you are choosing a top brand, then you would get the luxury of unlimited warranty. Consider this as an investment because the quality of the binoculars really matters! If you are investing in a poor-quality binocular, then the efficiency will go down. This does not mean that the most exclusive and expensive ones will be the best-quality ones. It is possible to find inexpensive yet efficient binoculars at a great price. The manufacturer may increase the price by creating a fancy design or adding a specific feature. Do note that the design does not have any effect on the product. Drum rolls, please! Here is the list of the Top 10 Best Compact Binoculars just for you. Since I have carefully picked each product for you, it would be wise to compare after going through each. There are enough choices for you to choose from. In fact, you can even check out the reviews of the readers on Amazon! We kept in mind the magnification, clarity, waterproof feature, lens diameter, durability, and stability. More importantly, we looked at the portability of the product as the compact ones should be lightweight and easy to carry. After religiously testing each product, I can proudly say that you are in for a treat because the following products are the best in the market. Looking for the best compact binocular for outdoor activities? The Wingspan Optics is a compact device used primarily for bird watching but it can be used for other activities as well. Since we are talking about portability, this product is pocket-sized. You can carry these in your pockets while stepping out for bird watching or camping. 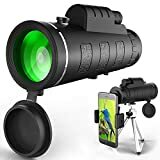 Whether it is star gazing, exploring the nature or deriving pleasure from bird watching, this binocular is highly efficient. You get clear and bright pictures with the 8x32 magnification. The majority of the buyers are worried about the damage and the product slipping from the hands. The good news is that this binocular has a no-slip design. It gives you a tight grip which means you can be free of all the worries of causing any damage to it. Take it along with you for concerts, hunting, bird watching, and camping without any stress in your mind. Keep your eyes on the target as this has a range of 1000 yards. If you are dissatisfied with the product, there is a 30-day money back guarantee. In case the product is damaged, the manufacturer will replace it. 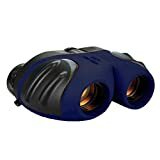 Kids and adults love these binoculars and they have a classic black color! It is not a pocket-size product. This is one of the best rated compact binoculars and that is precisely why we placed it on the top. With a lifetime warranty, this product is highly compact and you can take it anywhere along with you. We placed it on the top because it has received excellent reviews and has 8x32 magnification. Additionally, it is fog-proof and waterproof. As for the cost, it comes in the mid-range and easily fits your budget. The Skygenius 8x21 is a lightweight binocular which is great for short distance viewing. If the whole idea is to go for bird watching, opera, theatre, sports events or a special event, then this product is ideal for you. The price is budget-friendly and does not burn a hole in your pocket. If your child is off for a camping trip, he/she would need a binocular. 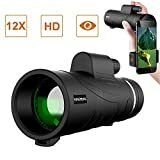 You can buy this cheap binocular for the kids or anybody close to you. The highlight is the center knob which allows you to focus. Even the kids can use this knob for easy focusing! In a nutshell, it is made for easy handling and with the lightweight trait, you can carry it for a camping trip or even hiking. There is no extra weight, which means you can prance around without feeling sluggish. The product has a roof prism Bk7 and it only weighs 0.28lb. It has a foldable design and can be easily kept in the pocket. With a small price that you are paying, this is the best bet. Focusing is easy, even for kids. Here is a runner up and it made way into the list because of its price, efficiency and compact feature. When we talk about compact binoculars, this product fits the bill as it has a foldable design and can easily fit into the pocket. Also, you would be pleased that even a child can use it without any hassle. The ease of use, clarity, price and lightweight nature are the USPs of this product. The Nikon 7576 is tailor-made for those, who wish to get a clear view of the natural beauty around them. This product is expensive but the brand offers what it claims. With an extra-low dispersion (ED) glass, you are able to see clear and sharp images. The product is water-proof which means that the device will stay safe in case of rainfall. It is possible that you might be camping or hiking and there will be uncalled-for rain. It is best to be prepared for the worse! Additionally, it is fog-proof which saves you from the cold and foggy mornings. 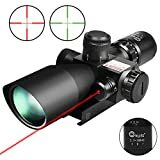 Whether you are a detective or just an adventure seeker, this product allows you to see far-off objects with a sharp eye. It performs really well in low-light scenarios and the heart feels good that it belongs to a well-known brand. The Monarch 5 is lightweight and has an eco glass lens which is fully multi-colored. Consider this as an investment and get this beautiful binocular home. Of course, it is an expensive investment but it is worth the price that you pay for. The image clarity is spectacular! 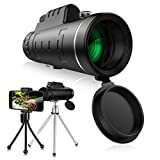 As per some of the reviewers, they wish that there was a way to click the pictures that they see through the lens of this binocular. It is not cheap but it produces high clarity and sharp images. Nikon is known for creating products which are made for excellence and great images. This product is sure on the expensive side but the highlights are that it is lightweight and has a durable body. This Nikon variant allows you to see clearly with the ED glass. If you have the budget to buy a good brand product then this is the right choice. The only drawback is that the focus knob may make squeaky sounds. As a beginner, you do not feel like spending a lot of money on a binocular. Especially when your kids have the habit of breaking things in the house, this could be a great deal. The Aurosports binocular is affordable and is a great addition in a beginner's cupboard. These have 10x magnification and an objective lens of 25mm. The product is waterproof which means that it is safe from most accidents. With a 6.9-degree field angle and range of 1000 yards, this is a decent purchase. Additionally, it is a lightweight product with non-slip. You could buy it for your kid and they can take it along for a summer camp or picnic. We do endorse the idea of letting the kid explore the world. This is a great gift option! Although the focus is not spot-on as per reviewers, this does a decent job for those who are beginning to explore their surroundings. While most of the reviewers were happy with the product and its low price, there were some who were not as thrilled with it. The price is low but this product has turned out to be an excellent one for beginners. If you have a hobby of watching birds, nature, and insects, then this product is great. You could buy it for the kids to help them explore the world. We personally love it for the affordability and it has all the features which could satisfy a beginner. As we mentioned that different users have different requirements, this product is best for intermediate users. The Celestron 71333 is a mid-size, lightweight and durable product which lasts for years. 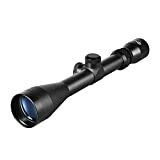 The durable and sleek product comes at a mid-range price and has a 10x magnification. We personally love the close focus which can range up to 6.5 inches. Getting a wide field view through this is easy! The Bak4 prism along with the phase coating helps in increasing the contrast and resolution. The product fits easily in the pockets of the users and gives a clear image of far-off objects. Two things are absolutely necessary for a binocular! You must check the objective lens size and the magnification. Both seem to be ideal in this pick! No matter what your hobby is, these binoculars will help you to see the distant objects clearly without any hassle. The product offers a wide field view. It is fairly expensive as compared to other products mentioned in the list. However, the price is less than the Nikon variant. If you love watching nature closely then opt for this product because the focus is butter smooth. We love the 10x magnification and lightweight trait of this binocular. 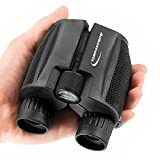 It is one of the best rated compact binoculars and has received rave reviews on Amazon. Nature has so much to offer in the name of beauty! The Bushnell Powerview is one of my favorites because it allows you to watch the best of wildlife and nature. It is a wide-angle device which comes in a mid-range. It has a beautiful design and is built for durability. The objective lens is about 50mm and the magnification is 10x. With an ergonomic rubber body, it gives you a better grip and is completely shock-resistant. Even if you are amidst rain or snow, these binoculars will not get slippery to hold. It comes with a limited warranty for a lifetime. You can take it as a ready device for many outdoor purposes. If you want a binocular with excellent clarity, this product does the job efficiently. We love how these binoculars look! Of course, it is compact and can fit easily inside your bag. They do not have a heavyweight, which means you can carry them around the world without feeling the pressure. The Bushnell product is meant for wildlife enthusiasts. We love this product for its 10x magnification and BK7 prism. Plus, it weighs very less and it is great for me because I can carry it for long walks and hikes. With the price you pay for this product, you are getting binocular with excellent clarity. If you want to indulge in prolonged viewing, then consider getting a tripod. The Occer 12x25 is a compact and lightweight pick. It is so light and small that you can easily carry it without feeling any weight. If you want portability then this product delivers the same. As for the USPs, there is a 25mm objective lens and 12x magnification. The BAK4 prism improves the quality of the images. We love how durable the binocular is! Additionally, there is a large eyepiece which allows you to view the images comfortably. The versatile binoculars can be used for camping, hiking, bird watching, opera, cruise, and any other outdoor activity. This is a pocket size device which has an FMC coating. We love how we could adjust the eyecups easily. If you wear glasses, you can easily watch the view through these binoculars. It has a range of 273 feet and 1000 yards. It allows you to see farther and clearer! If the whole idea is to go for a camp, hike, or even a special event, this is a great binocular for those purposes. Plus, it is easy to use and even kids can handle it with ease. Occer 12x25 is a product which comes at a decent price. The USPs includes durability, large eyepiece, compact design, and versatility. You can use it for multiple purposes and events! However, it comes with negative aspects such as focusing and no night vision. 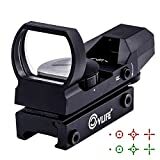 As per the brand, they claim that there is clear night vision but it does not deliver that. 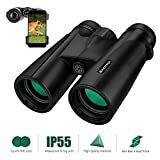 If you want a decent binocular for day use then this comes at a great deal. The large eyepieces allow you to view the images comfortably. A thumbs up for this product from our side! A budget-friendly binocular which fits any budget. This product is excellent for low-light and weighs very less. You can keep it in your pockets and set out for an expedition to watch the beautiful sight around. As for the clarity and brightness, it does produce fine images but they tend to appear darker. Since this is super easy to use, kids can handle it effortlessly. Although they are compact they can be a little heavier than the competitors. The Celestron 71347 has 10x magnification and is fog proof and water-proof. There are times when you are out for camping and hiking. These are the times when your binoculars need protection from the moisture. The carrying case is durable and is made of a fabric which protects the device from damage and moisture. Additionally, Celestron is fog-proof which means you can see clearly even amidst a foggy and wintry morning. If we keep in mind the price of the product, this is a great deal! You are paying a low price for a good binocular which solves the purpose. Planning to gift a binocular to your kid? This could be the best gift for him/her. We placed the product on #8 because it has the potential to be on the top list. It comes with a durable neoprene case which protects the product from moisture and any type of serious damage. It is fog proof and waterproof which means your device will stay safe in extreme weather conditions. For quick adjustments, there are twist-up eyecups. It has 10x magnification and the body is covered with durable rubber. Would we suggest you buy the product? Absolutely! It is affordable and is packed with innumerable features. Since I didn't want to miss what this esteemed binocuar maker has to offer alongside the 7576 Monarch, PROSTAFF 7S caught my attention. As I have 10 years of experience playing with binoculars, I couldn't resist digging into the phase-correction coating on its roof prism. I must admit it's a typical and quite conventional practice. The Nikon 16001 PROSTAFF is ideal for hunting, wildlife and even for the mountains. When you are looking for the best product, do consider checking the clarity and color. This product fulfills both the aspects. If you wear eyeglasses, then still you will enjoy a good view through this. Also, we personally love that it gives a full field sight. This is because it has turn and slide eyecups made of rubber. You can easily adjust it between the eyes. Additionally, this product is easy to hold even if it is raining or you are traveling to a wet place. It has a durable rubber body which protects the device even after it has fallen. With a well-known brand comes a heavy price! This product is heavy on the pockets and that could trouble the prospective buyers. However, you do get an excellent and durable binocular which lasts for years. It has a perfect compact size and is lightweight. It has a rubber body which makes it easy to hold. The lens cover is not decent. The add-ons are of poor quality. Although the product is excellent on its own the add-ons could be better. Since this product is from Nikon, you can never go wrong with the clarity and the focus. However, the strap and lens cover is not up-to-the-mark. Buy it for the lightweight, easy to hold and multilayer lenses (coated) feature. It sure is expensive but it is Nikon and delivers what it claims! G4Free 12x25 Compact Binocular is a part of the list for a very good reason! This product is famous for its image clarity, excellent magnification, and the water-resistant feature. For what you pay, the user is getting a great deal because it solves the purpose. For avid travelers, the product is worth the purchase because it has a range of 273 feet at a thousand yards. With 12x magnification and XMC technology, we believe that this product is here to stay. Although it cannot be submerged in water, it will be safe from the rain droplets. The product has a 25 mm lens and BAK4 prism. Since it comes with a cleaning kit and a pouch for carrying it, the storage and cleaning become easy. If you are looking for versatility then this product tops the list because you can use it for a number of purposes. It can be used for hunting, hiking, bird spotting and special events. Affordability is the key! It does not create a dent in your pocket as the binoculars come at a reasonable price. A small price to pay and endless features are offered on the table. It is water-resistant but only for normal rain droplets. The green film lens allows you to see clearly in the feeble light. Hand strap, cleaning cloth and carrying pouch is included. It has an excellent range - 273 feet @ 1000 yards. The crisp HD quality images produced by this binocular is the reason why we chose it as the 10th best product. Additionally, it comes with hand straps, cleaning cloth and a pouch to carry the product. If you are looking for a portable, water-resistant and high-quality binocular then this shall solve the purpose. There are certain technical glitches which can be fixed but all in all, it does a great job. Every product that you buy would require maintenance. Consider it as your baby, who needs proper care and cleaning. There is no doubt that the binocular is handy, compact and lightweight but it would require lots of care. Whenever you take them out to use, it is a no-brainer that the binoculars will get dirty. There will be dirt, oil, soil and other elements which need to be cleaned. In fact, the lenses need to be cleaned every now and then to get clarity. If you do not clear the lens, you will get a hazy and dusty image. Also, the binoculars will become less efficient without proper care. When we talk about hunters, bird watchers or even adventure enthusiasts, they are always amidst soil, dirt and moist areas. It is 100% possible that the lens and the body will get dirty. In order to safeguard the permanence, you would need to follow some basic steps of cleaning, storing and protecting the product. Here's some happy news for you! I have explained each aspect carefully and it will help you to do each step with precision. Check it out! Most of the products come with a guideline book. This will have all the instructions that you would need to follow. Even the best cheap compact binoculars come with an instruction handbook. You will find it inside the package! In general, the user needs to use a moist cloth to clean out the rims, barrels and focus wheels. If there is a hard-to-reach place, you can use compressed air to blow away the dirt and soil. The external body is fairly easy to clean! Just keep an important point in your mind - never breathe on the lenses because that would be an obstacle. A special cloth will be provided to you by the manufacturer or you can buy a special lens cloth to wipe the dirt. You can even use a microfiber cloth to clean up the exterior of the binos. Use a good-quality optics solution or water to moisten the cloth. Make circular motions gently on the surface to clean the product. The best compact binoculars usually come with elaborate instructions for cleaning the lens but you can use these simple instructions to do it yourself. Please note - I have seen too many people, who breathe on the glasses and then wipe it off with the side of their shirt. It just degrades the image that you see! DO NOT USE the Breathe-and-rub method. You will only get a frosty glass and nothing else! It is possible that the lens will get scratches and you will not be able to see them. Use a compressed air can blow off the dust on the lens. You can use a lens cleaning pen as well to blow the dust. This is not harsh and will not cause any damage to the glass. Additionally, some binoculars are water-proof which means you can run the body under the tap but we will not recommend this step. Always use gentle strokes to clean the exterior! A moist cloth will solve the purpose. In case there is oil on the lens, use a tissue and put a drop of the cleaning solution. Use the circular motion to clean the oil on the lens. Once the product is clean, use a soft and dry cloth or a lens tissue to wipe it. Never use paper towels or the tissues that you find in your toilet. A big NO! In fact, do not even use your towel because that could damage the lens and lead to scratches. The majority of the prospective buyers have several dilemmas regarding the storing and protecting aspect. Let us understand the best way to store and protect your precious binos! To extend the lifespan of the binocular, it is important to store them properly. Most of the products come with a carrying case. After cleaning or using the product, keep them safely inside the case. Ensure that it is a clean and dry place! Also, direct sunshine is not good for these and that's why you need to keep them in a dark case. Make sure the lens cap is on when the binos are not in use. Once you take care of these small things, your binos will work magically and efficiently for years! If you are using the best binoculars for hiking, birding or hunting, it is advisable to protect them like a baby. It is an investment and that is precisely why you need to take proper care and protect them from the harsh weather. When you are out on the field, use a harness along with the binoculars. You can easily find a harness in the shops near you or even Amazon! The majority of the hunters have a neck strap attached to their equipment because you never know when the animal would enter the scene! Never walk in the jungle with the binos swinging in your hands. When you are jumping, climbing a cliff or just performing an adventure sport, keep the binos in a secure place. While driving, keep the binoculars in the carrying case. If the equipment is exposed to the sun, the lens will get damaged. Additionally, the thieves might get interested in your equipment and will run away with it. I wonder how much money they will make with your device! Just in case the binos drop in salt water or fresh water, get them cleaned by a professional in order to prevent it from rusting. You must get it cleaned within three-four days after it gets soaked. Even though you are investing in cheap compact binoculars but you are spending a certain amount. Whenever it starts raining, keep them in the carrying case. Buy a rain guard for your precious device! If you think that you can spend extra bucks to get a weatherproof binocular then that would save you from the worry of keeping it dry. Always use a lens cover when the product is not in use. Get a waterproof guard for the product. Never use towels or paper tissues to clean the lens. Invest in a good optics cleaning solution. Keep the product away from direct sun. Once you take care of all these pointers, you will have a long-lasting and good binocular. Whether you are an individual, an adventure company or a professional hunter, always keep the binoculars clean, clear, protected and well-stored in the carrying case. We hope that you enjoyed reading the post and most importantly, I would be elated to know if it helped you choose the best product or not. All the product mentioned-above are tried and tested. The cheap compact binoculars are surely efficient in real but they have received good reviews from existing users. As a wise buyer, I would suggest you compare all the products and read the 'things to consider' section carefully. If a product fits the bill and has all the specifications and features that the best compact binoculars for the money should have! Keep in mind the requirements, features, budget and even the ease of maintaining and cleaning before you purchase the best compact binocular. After all, you have to use it! As for me, I would continue my journey of finding better options every year. If you know anyone in your circle who is looking for the right binoculars, then forward this to them as this would help in making the right choice. Did you like this post? Show some appreciation, love and like the post! As a writer and researcher, it is always encouraging when readers and prospective buyers appreciate our efforts of finding the best product. I am 100% certain that you will buy the best inexpensive compact binoculars for yourself or your loved ones.